I am currently scratching my head about the New York Times’ Times Reader. The Reader was demoed to me last week by a Microsoft representative who was showcasing products developed with new MS products. Sync Times Reader, and you can have the complete Times, including the latest news and photos, wherever you go. Adjusts to any screen size. It’s easy to read and navigate, no scrolling. And you control the font size. You’ll have seven days of The Times at your fingertips. View a slide show with all of the day’s photos; click on a photo to jump to the story. Since when did the ability to read a newspaper offline, in an easy-to-read format, with a 7-day archive, with access to pictures become a differentiator from the online version of a paper? Maybe I am missing something, but surely this is simply getting online content offline? In an increasingly unwired age, is offline access to a website really an innovation? In case I’ve missed something compelling I’ve subscribed to the 30-day free trial, but I am yet to understand! If I could do a bit of time travel I’d go back and change the term “usability testing”. Although the title is quite descriptive, it is ultimately too close to “user acceptance testing”. And the use of the testing word is definitely a problem. The problem is that people associate testing (and in particular user acceptance testing) with something you do at the end of something. You test it to make sure it works. I’ve lost count of the number of times I’ve encountered that basic misunderstanding of the purpose of a usability test. Sure you can conduct a usability test at the end of a process on a finished product, but as any good usability practitioner will tell you, saving your usability testing until the end of a project when it is more costly and time-consuming to make changes doesn’t really make any sense. Good usability practitioners will advise that you spend two-thirds of your usability budget before you are one-third of the way through your project. This way your usability insights can actually inform the way the product is designed and developed. Early in a project, usability testing (and related research techniques) is a highly effective method of providing insights into questions that inform the design process. I encourage you to think of usability testing as design research – and maybe you could also call it design research from now on so that our less well-informed colleagues don’t get confused. Now where did I leave that tardis? BitWorking share with us the Dinner Table rule. I encourage you all to use it. If I ever go back into management one of the rules I’d enforce is “the dinner table rule”; that is, in a meeting, you can only use words you would use with your family at the dinner table. The email usability crimes continue apace here. I received this in today’s inbox. The email was about two members of staff that are retiring. It seems a nice idea to highlight that two valued members of staff are leaving the organisation. But there are a few problems here. There is no summary about what the email is about, just attached documents. Why is the information about their retirement contained within a PDF? I can’t show you the PDF, but essentially it is text that could easily have been entered into the body of the email thus reducing the scannability of the message, the speed with which I can digest it and the size (Mb) of the communication. 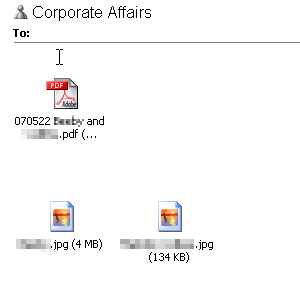 They inserted JPGs of both members of staff in the email. They included a print quality image of one of the staff members – 4Mb in all staff members inboxes!!! Include a summary of what the email is about, especially if the main bulk of content is going to appear in an attached document. When referring to members of staff, why not link to their profile on the intranet rather than including bulky images in an email. This may encourage adoption of the intranet. Make content suitable for the medium through which it is being distributed. That means reduce the size of images! I will have to find something else to write about or I’ll quickly be tagged as being the email usability guy – not the most exciting specialism! 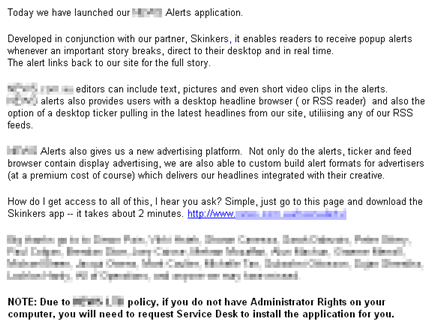 The problem being that I was so keen to look at and see the application, that I never got to the end of the email. I clicked on the link in the 5th paragraph and never read the 7th paragraph. This simple issue caused me to reboot my machine 3 times (call me stupid but I thought it might help), disrupt 3 co-workers for help and grow increasingly negative and frustrated towards the product. What usability lessons can we learn from my frustration? When writing an email don’t assume someone will read all of it before clicking off and doing something else. Place all warning/notes a link in very close proximity to the information they relate to (I am guessing this is an example of Rankin’s “locus of attention” in action). Don’t bug your co-workers until you’ve re-traced your steps (but it’s human nature isn’t!). Where Did Technical Writing Go? As someone who started out as a technical writer about 15 years ago and quickly diverted into interaction design and usability, I can certainly empathise with the sentiment of Jared Spool’s article, Where Did Technical Writing Go? I studied Technical Communication at Coventry University, and although I feel my studies were as relevant to interaction design as techincal writing, most of my peers went the technical writing route. Over the years it has been interesting to see the career archs of various folk. Certainly many of them road the tech boom and shortage of qualified tech. writers – and for many years I was very envious of the salaries and overseas jobs they seemed to be getting with alarming regularity. But I can only agree with Jared, the tech. writers lot is tough and getting tougher. But on a positive note I don’t believe the transition from technical writing to interaction design/usability is necessarily that tough. I found that after a few years of documenting unusable systems, it was relatively easy to channel my frustration more productively into making the systems easier to use in the first place. I’ve recently been doing some work on the business listings site True Local. The site has just launched an auto-suggest feature for keywords and business listings. To me this seems like a good way of funnelling users to information the site actually has – and thus reducing the chances of zero results. Obviously it is as reliant on the effective use of synonyms as any search engine, but I’m surprised that few (if any) other business listings sites seem to use this technology. Are True Local innovating or are they (and I!) missing out on some logical reason for not doing this?